Letter E week was beyond Exciting – some might even say, Exhilarating! The students did an amazing job of bringing in letter E shares. Some of the highlights included: Egg, elephants, Elmos, even an echo machine. One of our German students really threw us through a loop when she placed a rubber duck in the share box. The teachers informed her that letter D week had passed but it was only until they saw the tag on its neck that they realized she was right! 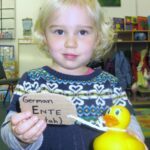 The German word for Duck is Ente (en-tah) so in the share box it went! On Monday, the students started off the week by working on their letter identification tracing and coloring pages. They also practiced making the sounds of the letters in the different pictures on their pages. 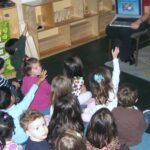 In the afternoon, the students had music were they sang along to and acted out some of the classroom favorites – particularly the Eensey Weensey Spider. They also went on a letter E Hunt where they had to locate all of the letter E’s in the classroom! On Tuesday, the students continued to work on their letter E tracing and coloring pages. Later on in the afternoon, the students created a “E” list where they had to brainstorm a long list of words that started with letter E. The list included such words as Elbow and Eyeball. Some of the younger students were very confused by these words – none of them make the “ehh” sound like the letter E makes. This led to a discussion about how some letter are a little tricky and they change their sounds! These letters are called vowels – sometimes they say their name (long E sound – “E”) as in Eagle and sometimes they say their sound (short E Sound – “eh”) as in Egg. The students decided that vowels were “crazy letters” and moved on to their afternoon stations. On Wednesday, the students began part one of their Eagle Egg art project. 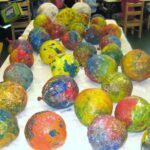 The teachers inflated balloons for the students to paper mache. The students dipped strips of shredded newspaper into the gooey concoction and then draped them around the balloon. At first, the students were a little hesistant to get their hands a little messy. By the end of the project, they seemed to really enjoy the messy project! The eggs needed to be set aside in order to dry. In the afternoon, the students completed their final week of “Greetings and Numbers Unit” in Spanish class. At the culmination of each unit, the students will complete an activity that will be stored in a class Spanish folder. At the end of the year, the teachers will assemble a Spanish Workbook of all of the activities that each student completed throughout the year for them to review whenever they wish! 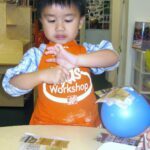 The number activity required the students to identify the number (1-10) or (1-5) and make fingerprints of the right quantity. 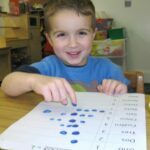 The students did an excellent job of counting in Spanish while making their dots – one might even think they were native Spanish speakers! 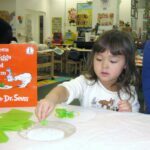 On Thursday morning, the students listened to the Dr. Seuss classic, Green Eggs and Ham. 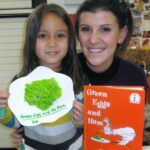 After hearing the story, the students had the opportunity to make their own Green Egg – without the ham! The students used green tissue paper to make the yolk of their green egg. After they finished, the teacher gave the students’ egg a title like the original, just a little different. On Thursday afternoon, the students took turns playing fun Spanish counting/number games while the Tuesday/Thursday students completed their finger-painting number activity. 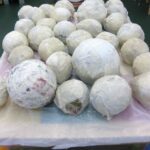 By Friday, the eagle eggs had finally dried! 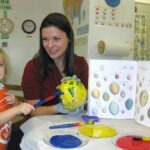 The teachers found the perfect book to read before the students began decorating their shells – An Egg is Quiet by Elizabeth Kennedy. The book shows all different types of eggs and the different animals that lay them. It also explained why eggs crack or hatch with some informative pictures as the animals grow and outgrow their shell! After hearing the story, the students could hardly wait to work on their eggs! Using paint, they created some beautiful designs to decorate their egg shell. They turned out great. Later in the afternoon, the teachers put together an egg presentation where the students had to guess Whose Egg is it? Given three choices, the students selected which animal they suspected that the egg belonged to. The students had a blast before heading into their afternoon stations. What an EGG-cellent week! See you next week for some Thanksgiving fun!